After 83 minutes at Wembley on Sunday it seemed unlikely that Willy Caballero would be the star of the Capital One Cup final. The Manchester City goalkeeper hadn't needed to make a save. Then Philippe Coutinho scored with Liverpool’s first shot on target, to cancel out a 49th minute strike by Fernandinho. Caballero later made one good save, blocking a close-range header from Divock Origi in the second half of added time. At the other end, Simon Mignolet was both a hero and a goat. 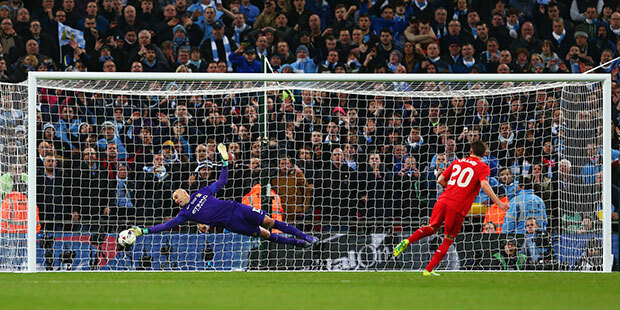 The Liverpool goalie allowed Fernandinho’s shot from a narrow angle to squirm through his arms. “From this angle it should not be a goal, everybody knows this,” Jürgen Klopp, the Liverpool manager told Sky Sports after the game. Yet Mignolet had already made one fabulous save from Sergio Agüero. Late in the game he made close-range blocks from Fernandinho and Yaya Touré. In the shootout, Fernandinho hit the post with City’s first spot kick. With his team trailing, Caballero reached out and grabbed the cup. He dived left to save from Lucas, then dived left again to stop Coutinho and finally hurled himself right to keep out a hard, low shot by Adam Lallana. When Touré converted the next kick, City had won with a round of shots to spare. He also said he did not have any clever tactical explanation for his saves. “My intuition helped me,” he said. The victory gave Manuel Pellegrini his third trophy as City manager. But, for the second time, that trophy was the league cup. That is not the cup he was hired to deliver, which is why he will be leaving at the end of June. Yet the victory vindicated Pellegrini’s policy of treating his players with respect. He had kept faith with his backup goalie, even though Caballero struggled when City lost 5-1 at Chelsea in the FA Cup the week before. “I am blessed to have this coach now,” he said. The events of the past week have also vindicated another of Pellegrini’s much-criticized choices. Last weekend, he gave five teenagers their debuts in an FA Cup match at Stamford Bridge. His side was crushed. Three days later, City’s first team returned and overpowered Dynamo Kiev, 3-1, away in the first leg of a Champions League round-of-16 match. Now they have won a cup final. City can still dream of an unlikely treble. It will be a tough ask. EPL leaders Leicester and its human shield, Tottenham, both won in league play over the weekend. City, in fourth, is nine points behind one and seven behind the other. The last eight of the Champions League is likely to contain Bayern Munich, Barcelona and Real Madrid as well as Atlético Madrid, Wolfsburg and Paris Saint-German. If City pulls off a miracle and finally wins the Champions League, which would mean Pep Guardiola’s Bayern didn’t, Pellegrini will be too classy to raise a finger to City’s owners. There are two traditional themes at English cup finals. The first is the poverty of the soccer. The second is quality of the atmosphere. Games at Wembley are just about the only club games when the support for both sides is numerically equal. The first 80 minutes fitted both patterns. The noise was tremendous, the play wasn’t. It was difficult to believe that less than two years ago these two clubs fought out a thrilling battle for the Premier League title. Liverpool has tumbled. City, despite Pellegrini’s brave talk, has slipped. Even as Liverpool struggled its fans took great pleasure booing one of the heroes of that title near-miss in 2014. Raheem Sterling forfeited their love when he forced his way out of Anfield last summer. Liverpool fans could take inspiration and, in the end, consolation, from two truly horrible second half misses by Sterling. Twice he had space and time in the middle of the penalty area and failed even to hit the target. “We missed too many goals,” Pellegrini said, without naming names. If only Sterling could shoot straight, he might have followed one of the scripted lines and settled the game against his former team. But he can’t. That left Caballero to ride to the rescue. Still Sterling will have another chance when City plays Liverpool at Anfield in the league on Wednesday. At least neither team will be able to use the excuse that it played extra time in a cup final just three days earlier.